" 'My mother was a cleaning lady all her life,' Simons says, sprawling on a sofa in the grey cocoon. He is dressed in his habitual khakis. A big bowl of fat roses sits on the table between us like an aromatic shield, although it also looks faintly incongruous with his slightly ascetic air. At 44, arrestingly blue-eyed, tall and crop-headed, he still somehow looks like a boy scout. 'She didn't have many opportunities to indulge her creativity but she was always arranging bouquets of flowers for the whole street.' The fragrant banks of peonies and lilies that lined the walls of the adjoining salons where he showed his first couture collection for Dior were a tribute to her and to Christian Dior, who was also partial to flowers. 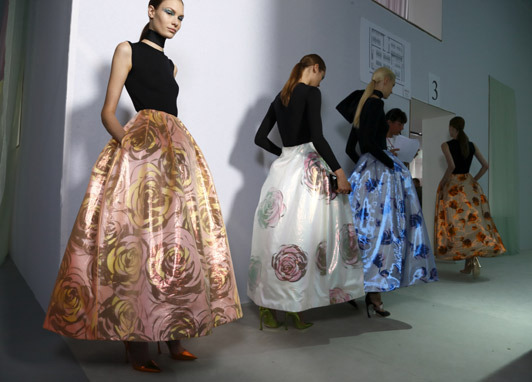 'I have created Flower Women,' Dior exclaimed on examining the slender, stem-waisted skirts of his New Look in 1948. " I already LOVED the flower covered walls at Raf's first show for Dior, but now that I know the story behind it, I might love it even more. I really like everything Raf has done so far for Dior and can't wait to see this iconic brand develop even more. In the meantime, have a look at the Dior exhibition which is going on at Harrods until April 14th. I can't wait to go in for a peek!